Details: CULPOL Commentary 3, IRMO, Zagreb, November 2017. The concept of cultural diplomacy has traditionally been understood as a governmental practice conducted in the national interest. However, the possibilities of person-to-person communication have changed; non-state actors have emerged as significant players in the global sphere, assuming roles that previously belonged to states. Taking into account the European Union’s (EU) policy framework, as well as EU activities concerning the role of culture in its international relations, this paper focuses on new approaches to cultural diplomacy: the proliferation of non-state actors; as well as the shift from self-promotion to the promotion of dialogue, the building of trust, the pursuit of conflict resolution and the establishment of bonds between individuals of diverse cultural backgrounds. 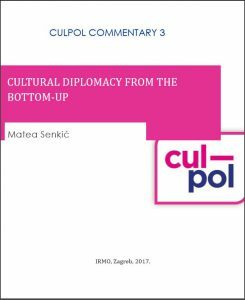 These new approaches are also highlighted through the analysis of selected projects that serve as good examples of new directions in cultural diplomacy.